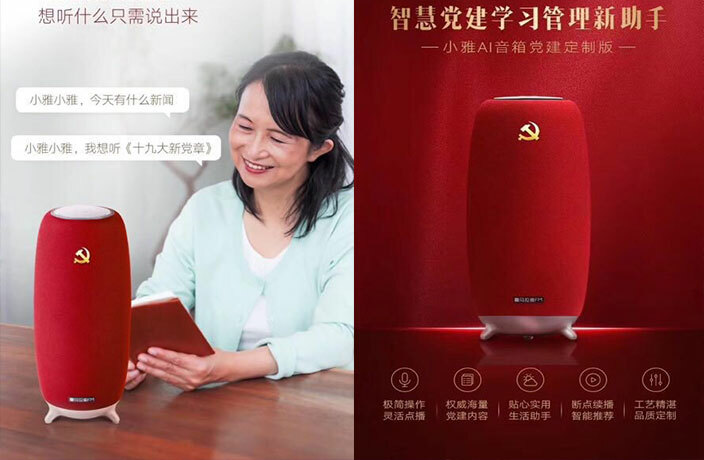 Introducing the CCP's special edition Xiaoya, a smart speaker that can educate you on the ins and outs of the Chinese Communist Party anytime, anywhere. Xiaoya is a thermos-sized AI speaker that is made by Ximalaya FM, an online podcast and audio streaming platform in China. The smart speaker has been touted as “practical and portable” – a winning combo, by our assessment. Ximalaya FM recently partnered with the CCP to create a red, Party-themed version of the audio unit. According to Sohu, the aim of custom-made Xiaoya is to “improve Party-building efforts.” Another reported aim is to change learning habits: no longer will members learn about the Party at a designated time with book in hand, now members can learn about the Party at all times, using the latest technology to maximize flexibility. Content can be found on the Little Red Flower Party Building Cloud Platform, which is built in the speaker and offers a suite of courses covering the basics of Party doctrine. The platform automatically updates relevant lectures, collects data on user progress and provides questions to quiz the eager learner. Official Party members can now keep abreast of the CCP’s latest developments and policies with ease.